The Joe LaBarbera Quintet: Live! This is the second Jazz Compass album I’ve heard, and each of them upholds the admirable standards expressed in that statement. Bassist Warrington, who led the other one ( Corduroy Road ), is a sideman this time with drummer LaBarbera’s quintet, recorded in concert nearly four years ago at Rocco, which I presume is a nightclub somewhere in the US (most probably California). Trumpeter Jenkins is there too, manning the front line with saxophonist Bob Sheppard, while pianist Bill Cunliffe rounds out the rhythm section. This is a roomy blowing session (the seven tracks average around ten minutes apiece) and everyone makes the most of the opportunity to stretch. LaBarbera opens with engaging tunes by Freddie Hubbard (“On the Q.T.”), Phil Dwyer (“Speak Softly”), Thelonious Monk (“Evidence”), Mal Waldron (“Soul Eyes”) and Sonny Rollins (“East Broadway Rundown”), then wraps things up with his soulful ballad “Kind of Bill (Evans)” and swinging “Message for Art (Blakey).” Cunliffe and Sheppard (soprano) are mesmerizing on “Kind of Bill,” which salutes the drummer’s membership in Evans’ last trio, while LaBarbera is surprisingly reserved on “Blakey,” comping superbly but earmarking no solo space for himself. In fact, LaBarbera solos at length only on “Q.T.,” which he introduces with an exciting two-and-one-half-minute enfilade that prefaces cogent remarks by Cunliffe, Sheppard (tenor) and Jenkins. This is an admirable quintet, one whose members work extremely well together and have strong voices of their own (but you probably already knew that). The excellent sound and generous 70- minute playing time help make this endorsement clear-cut and simple. Track Listing: On the Q.T. ; Speak Softly; Evidence; Soul Eyes; East Broadway Rundown; Kind of Bill (for Bill Evans); Message for Art (for Art Blakey) (70:04). Personnel: Joe LaBarbera, drums; Clay Jenkins, trumpet; Bob Sheppard, tenor, soprano sax; Bill Cunliffe, piano; Tom Warrington, bass. 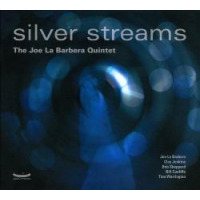 The Joe LaBarbera Quintet CD/LP/Track Review Joe La Barbera Jack Bowers Jazz Compass United States Live!